The LTLLT500 Mini Pallet Truck is designed for light to medium use. It's compact size and low weight allow it to be easily transported in vans as well as being very manoeuverable thanks to its minimal turning radius. The forks are designed to work with most printer's pallets and other small pallets. If you are not sure whether this truck is suitable for you, please email us a photo or a sketch of your pallet with the basic dimensions. 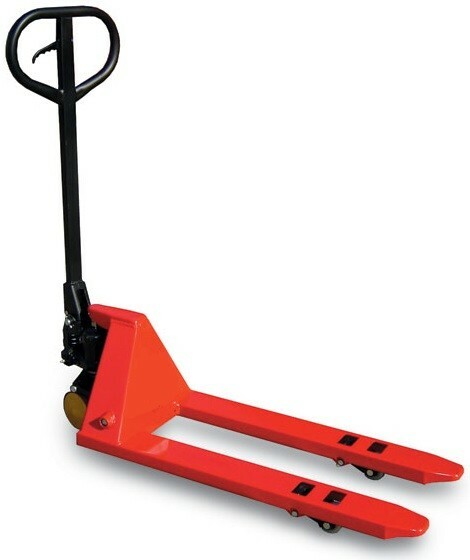 This Mini Hand Pallet Truck also has a lowered height of only 60mm, making it ideal for small low profile pallets. The Mini Hand Pallet Truck is very popular in the printing and photographic industries as well as by delivery van drivers with little room in the vehicle and/or weight limits. If you need any other information, please give us a call on 0800 458 8025.